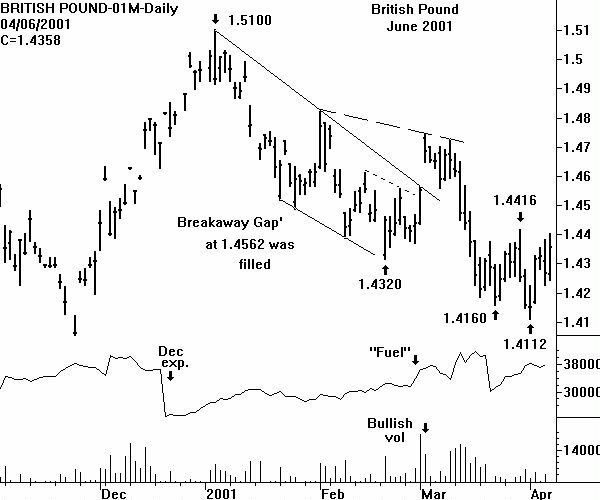 Regular readers of CHARTWATCH's British Pound Research know that an excellent bullish possibility is present on the weekly chart. This is the prospect of a complex Head & Shoulders Bottom with a Double Bottom for the head. But a short term bullish technical reason, on the daily chart, is needed before a new long can be recommended. This has not happened - yet. A bar chartist is (once again) looking for a small H&S Bottom to form on the daily chart. What is necessary to fulfill this possibility is a price decline on declining volume that does not take the June future below 1.4112. Then another price up move must start. One reason for not chasing Sterling with a buy order at the present time is the fact that the price drop of 96 points on Friday March 30 was not due to long liquidation. Total open interest rose a significant 2,277 contracts. Therefore, a price decline could easily occur before the bears give up. CHARTWATCH is getting ready for this possibility with small buy orders below the market. Based on possible symmetry with the left' side of the chart, a price decline to the 1.4160 area would be perfect. Therefore, small (one-half) longs will be suggested if the June British Pound declines to 1.4164 during the new trading week. If this does not happen, there still should be plenty of time to formulate a bullish strategy.